Alicia Lieu grew up playing the piano, flute, and trombone in San Jose, California. She earned her Bachelor’s degree from UC Santa Barbara where she studied composition with Dr. Leslie Hogan and won first prize in the UCSB Wind Ensemble Composition Competition. She received the honor of speaking at her graduation ceremony and is featured as a distinguished alumnus. She completed her Master of Music in Composition at the San Francisco Conservatory under Elinor Armer and was awarded the Kris Getz Composition Prize. In Paris, France, she studied in the tradition of Nadia Boulanger and premiered three of her works. In Paris, Alicia learned under the tutelage of Dr. Philip Lasser of The Juilliard School, Narcis Bonet, Mark Shapiro, and Ecole Normale de Musique faculty member Michel Merlet. Alicia spent time abroad in Shanghai, China studying Chinese music composition, Chinese, and piano. Alicia then moved to New York City to study composition, counterpoint, and harmony with Dr. Philip Lasser. She has been a teaching artist with Kollage Community School for the Arts, Midori and Friends, and the San Francisco Conservatory where she also served as the Conservatory in the Schools Outreach Coordinator. Alicia has conducted in master classes in New York, St. Petersburg, Russia, the Czech Republic, and Bulgaria. Her teachers include Maestros John Keenan and Paul Nadler of the New York Metropolitan Opera and has also been coached byDon Schleicher, Larry Rachleff, Diane Wittry, Mark Stringer, Alexander Polishchuk, Kirk Trevor, Tomas Netopil. 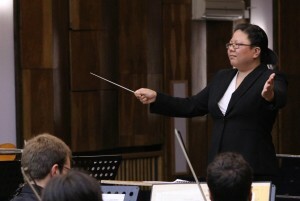 She is the founder of two organizations in New York City, Composer’s Collective and New York Conducting Institute.